I’ve been banging the prosecco drum on this blog for years but it now appears that I am not really saying anything that Americans don’t already know. Imports of sparkling wine from Italy to the United States are up 73.1 percent from 2005 to 2010, according to Impact Databank. That translates to 2.58 million cases brought in in 2010. Funny how things sometimes converge. I was talking about a review by Gary V of some prosecco and commenting how the bottle he tasted had a screw cap; something I had never seen on a bubbly before. Well I came across this press release for Riondo prosecco. In it they state they are ditching the familiar mushroom cork and going to all screw caps. Reason given seems to be that it will retain the bubbles longer for partially consumed bottles- sounds plausible but it’s not a problem I encounter regularly. Now loyal readers will know this is one of the house proseccos in regular rotation at stately Fred Manor. It’s great stuff and an excellent value. I confess I will miss the romance of the pop of the cork though. As soon as I see some in Frederick I will give it a try and let you know. Had a fantastic prosecco this past weekend. It was Collalbrigo Brut Prosecco Spumante NV. I picked it up at mecca (aka the Wine Library. See video on top of page at right) and just loved it. Best of all it was only $10.99. 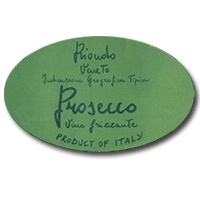 Its made from 90% Prosecco and 10% Pinot bianco grapes. Nice pale golden color. We thought it was just a little more complex and interesting than Zardetto. Had a nice rich mouthfeel. Anyone know where I can buy it in MD?